The way we set limits has such profound implications for our parenting: it’s the difference between parenting in a constant state of anxiety, and being truly calm and confident that you’re making the right decisions as you move through your day. If we set ineffective limits, our child never knows where we stand. They push and push and push because they know we will allow it, then finally we blow up because they pushed us TOO FAR and they end up in tears (or angry) and we end up angry (or in tears, or both). But doesn’t setting limits mean being “harsh” or “punitive”? Not at all! When we set the right limits (by which I mean the right limits for your family), you can hold those limits effectively and the testing behavior will diminish dramatically. The result? More harmony at home. Less uncertainty for you. More confidence for your child. Give it a try! Should we just Go Ahead and Heap Rewards on our Child? 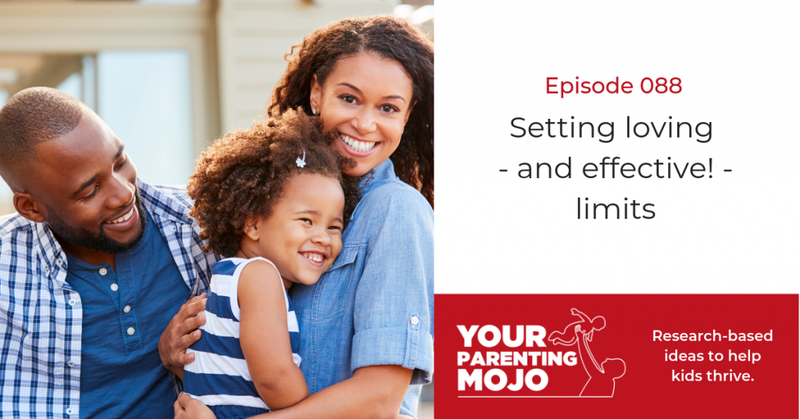 Hello and welcome to the Your Parenting Mojo podcast. Today we’re going to discuss a topic that virtually all parents find difficult at one point or another, and that’s setting and holding limits. What’s the purpose of setting limits? How do we know we’re setting one where we should be setting one? And how do we set them without getting into a big fight over something that ultimately turns out to not be that important? And can there really be cultural issues at play here? Why yes, of course! It’s parenting, after all… So we’ll look at all of these things today. Zinacantecan elders in Mexico critically discuss the child’s behavior while the child is present but otherwise don’t interact with the child; the child is expected to ‘overhear’ and modify their behavior. Shame is used in a variety of Asian cultures, from Bali to China to Japan to Taiwan. Parents in these cultures will tell others of the child’s misdeeds in front of the child, will ridicule, mock, and laugh at the child. Samoan children are reigned in with threats that animals will come and eat them, and the Kaoka elders on Guadalcanal warn that giants will take naughty boys and girls and carry them off to a cave, where the bodies are cooked and eaten. Frightening Bible stories – as well as folk tales - have been used to control European children; in the 1800s children in England were taken to the gibbet to view rotting bodies hanging there while being told moral stories – and then they were whipped when they got home to make sure the lessons stuck. And where stories, proverbs, and shame fail, corporal punishment picks up. The Mfantse in Ghana will even lightly cuff an infant for crying for no good reason, while parents in Samoa “believe in the unique efficacy of pain as a means of instruction, and the Rwala Bedu in Syria will spank small children with a stick and slash older children with a saber or dagger. Corporal punishment is most common among societies where tribal warfare and inter-village conflict are frequent, as well as where living space is at a premium and children must learn to control their emotions so as not to encroach on other people’s space. There is actually some evidence from neuroscientific research that the release of adrenaline during emotional arousal enhance memory. I plan to do an in-depth episode on spanking at some point but this research suggests why people in so many cultures around the world use physical punishment: because it helps the child to remember the event and their transgression. Perhaps the child might also learn some unintended lessons as well, though, including “I can’t really trust my parent” and “it’s OK for bigger people to hit smaller ones.” In addition, this can cause the excessive power assertion in the relationship becomes more apparent to the child than the parent’s love and caring, which may result in the child’s acting out of their hostile impulses particularly to other people who don’t have power (so siblings, for example) and possibly toward people who do have power if these people are permissive (such as permissive parents). In societies where children are actively encouraged to fight each other then acting out on violent impulses is perhaps not a bad thing, but in our society where we want our child to get on with their siblings and friends without hitting them, we can start to see how our own interactions with our child serve as role models for how our child treats others. And, as a side note, I have yet to find an anthropological study that discusses the children’s experience of being shamed or beaten or how this impacts them as adults. The studies always focus on parental practices without ever looking at what are the effect of those practice on the child. And there’s Dr. Amy Chua’s book “Battle Hymn of the Tiger Mother,” which argued for the Asian parents’ much more controlling approach to child-rearing. The book was written for a Western audience, of course, but it turns out that Asian children may actually genuinely appreciate this style of parenting. Two American researchers surveyed both European American and Korean adolescents and found that the more controlling European American parents were, the less warm the children perceived the parents to be. But in Korean children the pattern was reversed – the more controlling the children rated their parents, the warmer they rated them as well. So some of the same behaviors engaged in by European mothers would be perceived by Korean children as acts of love and caring, rather than efforts to dominate and control. But that study was done in the 1980s, and in the 1990s some Chinese researchers studied second grade children in Beijing and found that parents who used more power-assertive parenting behaviors had children who were more aggressive and disruptive in the classroom, weren’t liked as well by their peers, and had lower school achievement. Parents who used a more authoritative style, so proved limits and structure but also warmth and connectedness, had children who were less disruptive in the classroom, were well-liked by their peers, and had better school achievement. A much more recent study from 2014 found that both Chinese and Canadian children preferred parental discipline that was based on warmth rather than love withdrawal, which implies that Chinese parenting approaches are rapidly becoming more westernized. My aim in telling you this is not to demonstrate the superiority of WEIRD methods over those of other cultures, but to point out that parents in different cultures are preparing their children to participate in different kinds of interactions as older children and adults, and so different kinds of preparation is useful for this than for interacting in our society. Even within WEIRD cultures there is a variety in practices: all of the five sets of parents who were interviewed for one study reported using corporal punishment, with most stating that it must be accompanied by an explanation for its use (this is, of course, a small sample and is pretty typical for interview-style studies). One parent believed you should “spank with love and instruction.” Other methods used included scare tactics and intimidation, and spanking early in an effort to avoid the need for it in the future. One parent said: “I’m real conscious of making sure my cute little black son here doesn’t become one of the people they (meaning European Americans) are afraid of walking down the street (in) five more years.” Another said “I’m trying to teach her…survival techniques, like how to survive when the odds are against you.” These African American parents are thus using the tools they have to prepare their children for the kinds of societal pressures the parents have been dealing with their whole lives. By contrast, European Americans are socializing our children to take a dominant place in the world. The way we permit them to negotiate boundaries teaches them that they can not only generate their own ideas but also challenge an adult’s initially proposed boundary. If our child misbehaves in public we might feel that both we and our child are being judged, but we know that others are not looking at us thinking we are bad parents because of our race. And we also know that in an ambiguous situation our child is likely to be given the benefit of the doubt and will be allowed to explain themselves before a decision about their guilt is made. So as we learn these methods, please do keep in mind that this set of practices has a goal that is unstated but no less powerful for being so. We should also teach our children that there are instances where while it may technically not be harmful for them to break a rule, not all children may experience the same luxury and there are times when we should not allow rule negotiation because of this unfairness. Also, please be kind to parents you see out in the world, even when their discipline styles don’t match with your own. They are likely doing the best they can with the tools they have to meet their particular parenting goals. The research on respectful boundary setting originated in the work of Haim Ginott, an Israeli elementary school teacher who studied psychology at Columbia University. Ginott worked with troubled children at a Guidance Clinic in Jacksonville, FL where he developed his approach based on both compassion and boundary-setting. Ginott proposed that denying feelings makes the feelings more powerful, while acknowledgement of feelings allows people to heal so they can become better problem solvers. At the same time as showing respect for their children’s emotions, Ginott advised parents to be “strict” with unacceptable behavior. At the time this approach was untested, but Dr. John Gottman said in the foreword for his book Raising an Emotionally Intelligent Child that he could “provide the first quantifiable evidence to suggest that Ginott’s ideas were essentially correct:” these ideas founded the basis of emotion coaching, which we learned about recently in the episode on emotion regulation. So Gottman saw accepting emotions but being strict with behavior as two sides of an equation, with emotion coaching being the one we already learned about, and setting limits being the other. Also connected with Ginott’s work is self-determination theory, which proposes that all humans desire autonomy, competence, and relatedness, which is associated with better life outcomes for all people, not just children. So I’ll just briefly define each of these ideas: autonomy is the desire to feel like we control our own lives, which can be a difficult one for children who typically go through their day with every move scripted by an adult. Competence is the desire to feel a sensation of mastery over tasks and activities, which is often what children are trying to do when we’re hustling them along to the next activity or telling them to stop doing something. And relatedness is a sense of connection with others, which can suffer when much of our time is saying “Hurry up and…” or “Stop…”. What we want to tease out here is how we can set limits in a way that supports autonomy, competence, and connectedness so we achieve the benefits of self-determination, while still enabling the parent to set needed limits. We can also look to Dr. Diana Baumrind’s idea of an authoritative parent, which is a parent who is an authority (and who isn’t permissive) who makes age-appropriate demands, sets limits, and monitors children’s behavior, then the research shows that children do better when parents are “in control.” But there is a difference between being “in control” and being “controlling” – if you’re in control then you provide rules, guidelines, and limits. Controlling parents find compliance to be the most important skill their child develops, pressure their children toward specific outcomes, discourage discussions and negotiations on limits, don’t provide reasons for limits, and don’t respect children’s viewpoints. They may coerce their child into achieving a certain outcome or punish them if they don’t achieve it. But once again, this view of what are appropriate limits for children seems to be very highly focused on what are appropriate limits for white children, which is to say that Black parents might use a more controlling style of parenting not because they believe it’s the best approach for their child’s develpment, but because it’s the best approach to keep their child safe. So we think about refreshing our approach to setting limits, the first thing to understand is when we *can* set limits. As Magda Gerber, the founder of RIE has said, we need to remember that “discipline is not a set of rigidly enforced mandates, but a process in which the child learns to become a social being,” so we shouldn’t expect things of our children that are against the nature of their developmental stage. We can’t expect a toddler not to say “no,” or not to take all the available toys out, or not to grab a toy they want from a friend. Gerber says “knowing when to give [children] freedom and when to introduce limits is…the backbone of the RIE approach.” So by introducing limits we are introducing structure, which means providing guidelines and information that children need so they can meet the parent’s request. When you provide structure you communicate your expectations by doing things like making sure your request is age-appropriate, providing a rationale for your request, providing acceptable choices, and following through as needed. So perhaps the best way to avoid having your child throws balls in the house is to store balls outside so you don’t even have to set a limit, but if your child finds a ball and makes out like they’re going to throw it, you could say “I don’t want you to throw the ball in the house because I’m worried something might get broken. You can roll it on the ground if you want to or take it outside.” If your child proceeds to throw the ball, you could say "I can see you really want to play with the ball. I don’t want anything inside to get broken. I’m going to put it outside and you can play with it out there or find something else to play with indoors.” A more controlling approach would be to see your child about to throw the ball and say “Don’t you throw that ball! If you throw it, I’m going to spank you,” which doesn’t help the child to understand why the limit has been set or have any autonomy in determining how to meet it. It makes the child feel like they’re our enemy rather than our partner, so relatedness is undermined as well. Because at the end of the day, we don’t want to be reminding our child *forever* not to throw balls in the house, or to brush their teeth, or to tidy their rooms. We want them to take on these ideas as their own – ideally because they want to do these things for themselves, not because we are pressuring them to do the activity. This reminds me of the types of self-regulation we discussed when we talked about rewards with Alfie Kohn. When we have to reward the child for cleaning her room or punish her for not doing it, she’s externally regulated. We’re essentially doing the regulation for her by controlling or coercing her. She may have internalized the rule slightly when she engages in introjected regulation, which means the pressure and coercion are still there, but they come from inside her, so she might be thinking “I don’t want to tidy my room but my parent really wants me to do it.” She may feel guilty, anxious or uncomfortable if the room stays messy. A child who is using identified regulation has identified with or personally taken on the value of the behavior and sees it as important to their goals. She might clean her room because she recognizes that she’ll be able to find things more easily when it’s tidy. She doesn’t enjoy cleaning it, but she does it willingly. The final stage is integrated regulation, which is when the person has examined the issue and decided that it fits within their other beliefs and values. She doesn’t feel guilty if she doesn’t clean up, but she cleans up because she values having a tidy room. One of the things that prompted me to reach out to Alfie Kohn in the first place was to understand whether you can reward someone at the beginning of the process and expect them to integrate the idea later on – in other words, if I reward my daughter to get her to clean her room now, will she ultimately decide that cleaning her room fits with her own values so it becomes integrated into her ideas? Mr. Kohn was adamant that this is not going to happen, that extrinsic motivation in the form of parental control undermines the development of integrated regulation, and by extension the same happens with limits. After all, punishments and rewards are only quantitatively different; they’re both tools we use to coerce people into doing things we want them to do. When we punish children for doing things we don’t want them to do, we are undermining their autonomy (because they don’t get to decide if they want to take on this value), as well as their competence to examine an idea and take it on as their own, as well as our relatedness when we exert our dominance. It’s in providing the rationale for a limit that the child is able to decide whether the value aligns with their own values, and internalize this (if the rationale makes sense and is within the child’s ability to understand). And when we have a relationship with a high degree of relatedness that is generally positive, our child is likely to want to emulate our behavior, which includes taking on our values. Dr. Mark Lepper has argued that the key to supporting internalization is to exert the minimum amount of control that elicits the behavior, so the child can’t attribute their compliance to external constraints. So you want to exert just enough pressure to get the child to engage in the new behavior, but not so much that the child pays most attention to the pressure rather than to the behavior. Dr. Lepper tested this idea by using either mild or severe threats to prohibit children from touching a toy in his lab. He found that the children who received the mild threat were most likely to resist temptation in a completely different situation two weeks later. He concluded that compliance in the presence of strong constraints undermines internalization, while compliance in the presence of weak constraints supports internalization. If we’re not using rewards to gain compliance, then another option is to use power, although this ends up helping us to achieve immediate compliance but doesn’t support the child in taking on our values. A couple of studies shed some light on this. A really old one from 1960 that did use a small sample size of 22 families found that the more mothers used unqualified power assertion with children, the more those children became resistant to attempts by peers and teachers to ask the child to do something. The power assertion helped the mother to achieve compliance at home, but didn’t actually support the child in developing self-control that they could bring to school. A slightly more recent study from 1980 found that mothers who were more controlling and scolded their children frequently had children who didn’t internalize values as much as the children of mothers who scolded less and helped their children do things independently. Some researchers have found that securely attached children seemed to be more internally regulated than children who didn’t have a secure attachment with their primary caregiver, which again demonstrates the importance of relatedness to compliance. It’s possible that relatedness leads compliance (in that children with a secure relationship with their caregiver are more likely to comply), but also compliance leads relatedness in that taking on the caregiver’s values leads to greater relatedness. Dr. Grazyna Kochanska has done a lot of work on how children experience parents’ requests for compliance, and in one study she showed that what she called committed compliance, which is where the child takes on the parent’s values, occurred most often where the parent and child had a mutually positive relationship during the activity, reduced the need for the parent to exert more forceful control, and was seen both when the parent asked the child to “do” something as well as when the child was told “don’t” do something. By contrast, children who didn’t have as positive a relationship with their caregiver had to be reminded repeatedly not to touch some fun toys, didn’t seem to have internalized the value, and was most effective when the parent said “don’t” do something. I was particularly interested in this finding about saying “don’t,” since it goes against what practitioners of the RIE parenting philosophy tend to use: advice from proponents of RIE says that parents should say “Make sure to keep the pen on the paper” rather than “don’t draw on the table” because apparently the child only hears “draw on the table” and misses the “don’t.” Personally I sort of naturally gravitate to a hybrid model – if I’m requesting compliance then I’m more likely to use “do” (so, if I’d appreciate it if my daughter did something but it’s not the end of the world if she decides not to do it), and I reserve “don’t” for more serious rule violations. And when I use a “don’t,” I usually then follow up with a couple of “you can do X instead” options. You might want to experiment with this yourself and see which appears to work best for your child. Dr. Kochanska also found that contrary to popular wisdom about the Terrible Twos, children’s frequency of compliance actually stays pretty stable from toddlerhood to age 5, but the way that children express their noncompliance shifts over this period. They start off with a lot of passive non-compliance (although I have to say that it’s really not clear how researchers can distinguish between passive non-compliance and the child not understanding what they were asked to do) and direct defiance, and over time these were replace with more skillful forms of expressing resistance like simple refusals and negotiation. Simple refusals are when the child just says ‘no,’ and are actually viewed as a milestone in children’s development of autonomy. They express competence and more autonomy than defiance because the child’s goal is self-assertion rather than resisting the adult. Simple refusal is more skilled than defiance, which parents find aversive, but not quite as skilled as negotiation which is indirect and persuasive. I do want to talk a bit about how we can set effective boundaries and limits with our children but first I just want to mention a couple of ideas to put this in context. The first of these is a quote from a paper by Dr. Alan Sroufe, whose work on emotion regulation I relied on heavily in the episode on that topic: “Automatic compliance is not the hallmark of a competent two-year-old.” While we do want our child to do what we ask when we’re setting limits related to safety, for example, if they respond “yes, mother” *every time* you ask them to do something then your child is going to have a host of problems later in life. Although compliance is associated with mothers feeling as though their child has fewer behavior problems, by age 5, compliant boys in one study were perceived as having more internalizing problems – so things like anxiety, sadness, and fearfulness. And as we learned a long time ago when I first looked at Alfie Kohn’s book Unconditional Parenting, it doesn’t seem to be possible to raise an adult who thinks critically but only switches on this ability after they leave your house. So complete compliance is not our goal. And secondly, I want to refer back to what Alfie Kohn said in our interview on rewards, which is that often when a child doesn’t comply with a limit we assume the child’s behavior is the problem, when actually the limit is the problem. Now this isn’t to say that we should never set limits on a child’s behavior, but rather we should see if there are other ways of meeting everyone’s needs in the situation without using the particular limit that the child is protesting. We talked a lot in that interview about trying to get a child to put their clothes in the hamper, when actually what we should be doing is examining our underlying needs and seeing if there are other ways to meet those needs. So perhaps as a parent we have a need to feel that the house is tidy, and also that we’re not the only one doing all the work. And maybe there’s another way that our child can help us to meet our need (like helping with the laundry on the weekend) without needing to comply with the immediate limit that we set because we had set it without deeply considering the underlying needs. I do think that having an understanding of your needs can help you to form a framework for the limits that you set. So, for example, I have limits around safety issues, as well as respect for people and property. But this can play out in different ways in the moment. For example, I’m very sensitive to loud noises, so if my daughter starts playing an instrument really loudly I ask her to either take it to another room, or to play more quietly near me. If playing loudly is her primary need then she moves to another room; if she wants to be close to me in that moment then she plays more softly. Either way, both of our needs can be met without me needing to ask her to stop playing. (We’ll talk more in a bit about what to do when the child doesn’t comply with our limits). Dr. Ginott proposes three zones of discipline that we can use to form this framework. 3. Behavior that cannot be tolerated at all and must be stopped. For #1 you aren’t setting a limit. You’re encouraging the behavior or at least saying “why not?.” This is the place you want to be as much of the time as you can, and the key to this is to reassess whether you need a limit in the first place. When my daughter wants to head outside without shoes on, my husband will say “You can’t go outside without shoes on!” which often results in raised voices and tears, but I’ll say “Hey, you don’t have shoes on. Last time you went out without shoes on you stepped on a rock and hurt your foot. Do you want to put shoes on?” She then gets to make the decision about whether she wants shoes and not only do I not have to set a limit, but she gets to practice deciding how much risk she wants to take. The key here is that as much as possible, I have my default answer to a question be “yes.” If I’m not sure if I can say “yes” I say “I need a minute to think about it. Can you tell me why you want to ___?” And after I’ve thought about it, if possible, I say “yes,” which means I don’t need to set a boundary. For #3, behavior that cannot be tolerated, you need to decide what are your hard limits. As I mentioned, my non-negotiable limits are around safety, and respect for people/property. I do try to be as permissive as possible related to safety; I allow high climbing and jumping off things and just ask “what’s your plan?” to make sure my daughter has one. But I’m clear in my mind about obvious safety risks: things like running into the street, riding without a helmet, and using sharp knives unsupervised, and I do not allow these activities. Respect for people/property could be a little more nebulous, but for me it covers things like not making loud noises near me, and not drawing/painting on anything but paper or designated art materials. In either case, my limit is swift and firm and non-negotiable, my daughter hears this in my tone, and the vast majority of the time she complies immediately. But we get ourselves into trouble with #2 where the child’s behavior is not sanctioned but is tolerated. I was interested to see that Ginott’s reasons for permissiveness focus on the child, but we may introduce our own reasons as well: if we’ve already set 300 limits that day and we don’t have the energy for another one; if we hope that a little permissiveness now will be repaid with compliance later, or if we JUST WANT THEM TO DO WHAT WE SAY WITHOUT NEGOTIATING FOR ONCE. But pretty often when we set these limits we aren’t 100% sure why we’re setting them or we’re sort of setting them and hope that our child will comply. But then when they refuse we find ourselves committed to a course of action: popular parenting advice tells us to never back down because if we do our children won’t respect our authority. And if we hold the limit we find ourselves in a battle of wills over an issue we realize isn’t that important to us after all. So what should we do? Firstly, I try to push as many issues as possible out of #2 type limits and into #1 sanctioned activites and #3 hard limits. So I create more permitted activities for which I don’t need to set boundaries, and I offer choices that allow her to set her own boundaries. So instead of saying “don’t go outside without shoes,” I remind my daughter of the risk of going outside without shoes and let her make the choice. For each of these boundaries I have at least one reason that I can quickly and succinctly explain if my daughter wants to understand it, and because I have these reasons I can hold the limit firmly. Some of my limits are somewhat arbitrary (for example, we’ll do a snuggly tuck-in at or before 9pm but not after, which could just as easily be 9:15pm) but I won’t ever budge on these limits in the moment. Instead I would have a problem-solving conversation later where we discuss what’s not working about the current limit and how we can potentially shift it to meet everyone’s needs. To help with these limits around tolerated behavior, I develop policies for what I will do in times of distress, and stick to these plans. When my daughter is very tired she often wants to skip brushing teeth but I know that if I allow this, the next time she doesn’t want to brush teeth she’ll say “but we don’t always brush; we missed a night last week…”. So when she is tired I offer to let her brush with fluoride-free toothpaste (no spitting required) in bed, but not brushing is not an option. I will offer to wait for her until she is ready, but if this takes too long then we won’t have time for stories. I’ve read in the research literature about a couple of other ideas that you *could* try, although I’m not sure I’m on board with them myself. Dr. Mark Lepper again has done some work on getting children to comply using fantasy. So they told children to imagine they were pretending to be a robot picking up moon rocks or just set a goal for themselves like how fast they could pick up blocks. Children in both of these groups were more likely to comply with a request to pick up tennis balls two weeks later than children in a third control group who were just asked to pick up the blocks, and Dr. Lepper theorized that this was because the children in the moon rock and fast pick-up groups were more focused on the activity and less on the fact that they had been asked to do it. This meant the children thought they had *chosen* to participate in the activity rather than been coerced into it. I guess there’s not so much trouble with making inherently boring tasks more interesting using fantasy, but I know Dr. Lepper has also suggested that teachers use fantasy to get students interested in school work by doing things like asking children to calculate the angle of the transponder beam that Captain Kirk needs to use to beam Dr. Scotty back to the Enterprise, given the known distances between the Enterprise and two points on the alien planet, and I *do* think there is something wrong with using fantasy to try to motivate children to do something that *is* inherently interesting, like learning. The problem with this scenario is not that the child isn’t interested in learning, it’s that the lesson has no relevance to the child’s life so they are actually interested in learning something else that *is* relevant to their life rather than what the teacher and the curriculum wants them to learn. And Dr. Joan Grusec, who we interviewed on the show a few months ago on the topic of goal setting, has suggested that parents who want children to comply even when the parents aren’t around should make what she called “purposeful attribution errors” by attributing the compliance to the child rather than to the inducements. So the parent might say “you did that because you’re a helpful person” when the child does the dishes, even though in reality the parent did apply some subtle persuasion. I would strongly advise against this, firstly because the judgement of the child is essentially praising them, which is essentially a reward. We can tell it’s a reward because we’re saying it to try to get the child to engage in the behavior again, and rewards are highly coercive. Secondly, children know whether they were being helpful or not, and when their parent tells them they were helpful when the child knows they weren’t, the child is thinking “parent, either you’re not too smart, or you’re lying to me.” And in fact you are lying to your child, which I don’t recommend doing deliberately and regularly. So what do we do when a child protests a limit? The first thing to do is always to empathize, but to do so in a calm, confident way. Janet Lansbury had a great recent podcast on this topic, where the mother accepted emotions so readily that her children put on a performance for her. If this limit comes up often, think about it in advance and decide how much you’re willing to ‘give.’ I’m perfectly willing to allow my daughter to brush teeth in bed; I’m not willing to go further than that. Not brushing teeth is not an option. Deciding this in advance will allow you to set and hold the limit more easily. Then, if they don’t cooperate, you can calmly and confidently hold your original limit the next time. But what do you do when a child STILL refuses to cooperate? One of the most powerful tools to guide your child’s cooperation is to set up the environment in a way that invites their cooperation. For example, instead of saying “OK, let’s go to your room now” I shut off the light in the bathroom and turn on the one in the hallway, which naturally leads her toward her bedroom. I ask her to be responsible for choosing her coat and bringing it with her in the morning and putting it away at the end of the day, so I try to keep a clear pathway to the coat hook in her room so she can do this. But sometimes you need a little more help, and in these cases Dr. Ginott proposes using logical consequences to encourage a child’s compliance. I do want to clear up a terminology point, because I think sometimes parents struggle in understanding the difference between natural consequences and logical consequences. Natural consequences are ones that happen without the parent doing anything. So if the child chooses to go out without shoes on, they might step on a rock. If they choose to go out without a coat when it’s below freezing outside, they get cold (and I will usually bring the coat with me so the limit doesn’t become spiteful and my daughter has to suffer for the rest of the day, at least while she’s young – you wouldn’t need to do this with an older child). But a logical consequence is one that a parent devises. They key to effective logical consequences is that they must be tied to the transgression, and be used as sparingly as possible. The difference between logical consequences and punishment is that punishment is unrelated to the transgression and is only used to make the child remember not to transgress in the future. Punishments are related to the child’s interests (taking away a favored toy), the parent’s mood (how much the parent feels the child must ‘pay’), or the severity of a repeated offense, and so they don’t provide any additional information about the values and principles behind the parent’s rules. This means the child perceives the punishment as coercive and representing a withdrawal of the parent’s love. As we’ve discussed, the punishment induces strong emotions in the child which is likely to cause the child to remember something, although the child may internalize a message related to the parent’s use of punishment rather than the parent’s values or principles. Logical consequences may be unpleasant, but they need not be. Logical consequences may be pleasant if they address the problem and the child takes responsibility (e.g. cleaning the living room with fun music). A survey of 259 mostly French-Canadian mothers and children aged between 9-12 found that mothers rated logical consequences as both more acceptable and more effective than mild punishment, especially when those mothers usually used parenting practices designed to support autonomy (like reasoning and acknowledging feelings). Children rated logical consequences and mild punishments as equally effective, but logical consequences were perceived as more acceptable than mild punishments, and researchers believe this acceptability is important in promoting the internalization of the parent’s values in the child. In studies where parents used power with and without explanation, unexplained power assertion was correlated with child aggressiveness and transgressions when the child was among peers and away from parental power. We’ve actually recently started to use logical consequences with some success at our house. I really haven’t needed them up to this point because usually when we have a problem we have a conversation about the issue to identify our needs, and we come up with a plan to move forward that works for both of us. But my daughter has been really interested in cutting snowflakes out of paper lately and there have been both snowflakes and all those tiny little bits of paper that come out of a snowflake all over her room, and because we added this room where the kitchen used to be, it’s actually the first thing guests see when they walk into our house. I don’t require that it be kept perfectly tidy (my husband is actually probably getting a good laugh out of this example because I’m a lot messier than he is), but it was getting really really messy, and she didn’t seem to care. The natural consequence here would be to let it get messy until she decides she wants it to be tidier, but because the mess was in a pretty public area I wasn’t willing to let it go forever. I tried problem-solving conversations – we agreed to do 10-minute tidy ups before bed where we would tidy up together just as much as we could in 10 minutes. That worked for a day, and then she refused to participate. After another problem-solving conversation she said she’s too tired at the end of the night and wanted to do it right after she got home from preschool. I was skeptical but I agreed, and I don’t think that one happened even once. I tried parent educator Robin Einzig’s approach of modeling graciousness, so I tidied her room for her quite a few times. As I was doing it, I realized that modeling graciousness really seems more suitable to one-off things like accidental spills, rather than ongoing issues where it seems like I’m essentially cleaning her room for her every day. So I said to her: “Carys, this room is always a mess. I’d like to work with you to figure out some ideas for how we can keep it cleaner. I have some ideas, and I’d like to hear yours if you have any.” She said “What are your ideas?” and I said “well, I could take all the paper out of your room and if you want more paper, we’ll work together to make sure your room is tidy before you get it.” She said “let’s do that,” so that’s what we’ve been doing – and it’s working great! I didn’t think it would really work for her because she often uses several pieces of paper in one session but she will now come to me and say “can I have some paper please?” and I’ll say “Of course! Let’s go and make sure your room is tidy.” And then we’ll spend just a couple of minutes tidying up because it doesn’t take that long when you only have a couple of sheets worth of snowflake bits, and she gets more paper. So the keys to the effectiveness of this consequence are that it directly supports my daughter’s internalization of the value of keeping our house tidy. I didn’t say “you haven’t tidied your room so I’m taking away your favorite toy,” or “you haven’t tidied your room so we can’t go to your friend’s birthday party,” which would be examples of punishments. The consequence is directly tied to the thing I want to achieve. The second key is that I’m really applying a very minimal amount of control. I’m not saying she can’t have more paper or that she can’t cut those annoying tiny pieces out, or guilt-trip her into tidying up. It’s just that before she gets more paper, we need to work together to tidy her room. After some period of time she might decide she doesn’t want to have to come to me for more paper and she’ll be willing to keep her room acceptably tidy and at that point I’ll be ready to shift the control back to her. I was honestly hoping that I wouldn’t need to use logical consequences but I think that when other tools just aren’t working, they are something we can use to help us achieve our parenting goals. So, to summarize what we’ve talked about today, we discussed how discipline is conducted in other countries and cultures. We looked at self-determination theory as something that can underpin our interactions with our children, and that if we allow them to develop autonomy, competence, and connectedness with us that we won’t need to use traditional disciplinary tactics as often as we would if we attempt to over-control our child. I know it can be difficult when it feels like our child is constantly testing boundaries and doing things we ask them not to do, but having a positive relationship with your child is really important to get out of any cycle of persistent disobedience that you might have slipped into without realizing it. So if you find yourself in a persistent negative cycle with your child, try to take a step back from control that you might have been exerting and do some fun activities with your child that don’t require a lot of limit setting to build up a bank of positive feeling between you. Our discipline is most effective when we have a framework of acceptable behaviors that we operate within. The behaviors that are never acceptable, like things that really aren’t safe or show disrespect for people or property are never allowed, and as much as possible we allow the child to do pretty much anything else that’s reasonable. Whenever you can, try to stay out of that grey area in the middle where you find yourself setting boundaries that you can’t or realize you don’t want to hold. You may occasionally choose to allow behavior that you normally wouldn’t in times of extreme stress – either stress in the child or stress in you – but be aware that when you do this, you are setting a precedent for this to be repeated in the future. Rather than apparently randomly just allowing usually-prohibited behavior, which is how it may seem from your child’s perspective, you could say “I’m going to let you do this just this one time. Tomorrow when we’re both calm and have had some time to think I’d like to have a chat about how we can do this differently next time.” Where you’ve had several of these conversations and nothing seems to be sticking, and there is no real natural consequence or the natural consequence (like my daughter’s room getting filled with bits of paper that isn’t acceptable to me) doesn’t work for you, you might consider the lightest possible application of logical consequences that you can think of to meet both your and your child’s needs, and remove the consequence as soon as you don’t need it any more. If you want some more guidance on this topic, then I’d definitely recommend the books How to Talk So Kids Will Listen and Listen So Kids Will Talk, as well as How to Talk So Little Kids Will Listen, both of which are based in Dr. Haim Ginott’s work. The methods described in these books (which are very similar to the ones we’ve discussed today but have many more examples) have been found to be effective in a study of parents who participated in a series of classes where they learned how to use the tools in the book, and a randomized controlled trial (the gold standard of scientific research!) is underway. I hope this has helped you to understand a bit more about what the research says about setting limits, and how they can be useful, and how you can set them in a way that encourages your child’s developing self determination rather than undermining it. I’d love to hear how it goes if you implement some of these strategies! Andreadakis, E., Joussemet, M., & Mageau, G.A. (2018). How to support toddlers’ autonomy: Socialization practices reported by parents. Early Education and Development 1-18. Helwig, C.C., To, S., Wang, Q., Liu, C., & Yang, S. (2014). Judgements and reasoning about parental discipline involving induction and psychological control in China and Canada. Child Development 85(3), 1150-1167. Hoffman, M.L. (1960). Power assertion by the parent and its impact on the child. Child Development 31(1), 129-143. Joussemet, M., Koestner, R., Lekes, N., & Houlfort, N. (2004). Introducing uninteresting tasks to children: A comparison of the effects of rewards and autonomy support. Journal of Personality 72(1), 139-166. Joussemet, M., Mageau, G.A., & Koestner, R. (2014). Promoting optimal parenting and children’s mental health: A preliminary evaluation of the how-to parenting program. Journal of Child and Family Studies 23(6), 949-964. Kochanska, G., & Aksan, N. (1995). Mother-child mutually positive affect, the quality of child compliance to requests and prohibitions, and maternal control as correlates of early internalization. Child Development 66(1), 236-254. Kuczynski, L., & Kochanska, G. (1990). Development of children’s noncompliance strategies from toddlerhood to age 5. Developmental Psychology 26(3), 398-408. Lepper, M.L. (1983). Social-control processes and the internalization of social values: An attributional perspective. In E.T. Higgins, D.N. Ruble, & W.W. Hartup (Eds. ), Social cognition and social development (p.294-330). New York, NY: Cambridge University Press. Mageau, G.A., Lessard, J., Carpentier, J., Robichaud, J-M, Joussemet, M., & Koestner, R. (2018). Effectiveness and acceptability beliefs regarding logical consequences and mild punishments. Rohner, R.P., & Pettengill, S.M. (1985). Perceived parental acceptance-rejection and parental control among Korean adolescents. Child Development 56, 524-528. Soenens, B., & Vansteenkiste, M. (2010). A theoretical upgrade of the concept of parental psychological control: Proposing new insights on the basis of self-determination theory. Developmental Review 30, 74-99.